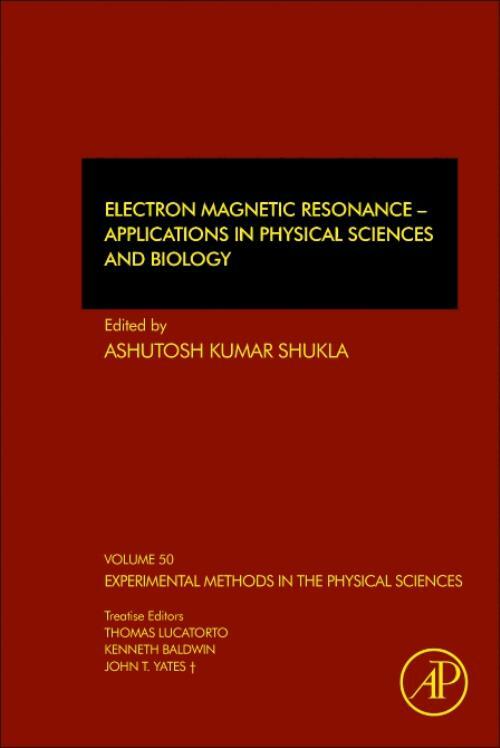 Electron Magnetic Resonance: Applications in Physical Sciences and Biology, Volume 50, describes the principles and recent trends in different experimental methods of Electron Magnetic Resonance (EMR) spectroscopy. In addition to principles, experimental methods and applications, each chapter contains a complete list of references that guide the reader to relevant literature. The book is intended for both skilled and novice researchers in academia, professional fields, scientists and students without any geographical limitations. It is useful for both beginners and experts in the field of Electron Spin Resonance who are looking for recent experimental methods of EMR techniques. Obtained his B.Sc., M.Sc. and D. Phil. degrees from University of Allahabad, India. During his doctoral work he has focused on the Electron Spin Resonance spectroscopy and optical absorption spectroscopy to study the transition ion doped single crystals. In addition to his exposure to the available CW-ESR spectrometers at leading institutes of his own country he is enriched with hands on experience with modern CW and pulsed ESR spectrometers at several leading International laboratories including University of Dundee, Scotland, University of St. Andrew's, Scotland and Kazan State University, Kazan. He has successfully completed research projects to his credit in the area of Electron Spin Resonance characterization funded by University Grants Commission, New Delhi, India. He has shared his research in many international events focused on Electron Spin Resonance Spectroscopy, organized in different parts of the globe including U.S.A., U.K., Germany, Spain, Russia. Dr. Shukla has a good number publications to his credit in this filed in peer reviewed journals and books. He also has co-authored a book on "Fundamentals of Electricity and Magnetism published by New Age International. Dr. Shukla is currently serving as Physics faculty at Ewing Christian College, Allahabad, a constituent institution of University of Allahabad, Allahabad, India.